Ampicillin is a semi-synthetic penicillin with a broad spectrum activity against a large number of Gram-negative and some Gram-positive bacteria. Ampicillin acts bactericidal by interfering with the cell wall synthesis of bacteria. Ampicillin 50% wsp is indicated for the treatment of enteritis in calves, lambs and kids caused by E. coli, pneumonia caused by Pasteurella multocida, and infections caused by Salmonella dublin. In poultry, Ampicillin 50% wsp is effective in the treatment of enteritis and airway infections caused by E. coli, Salmonella and Clostridium spp. 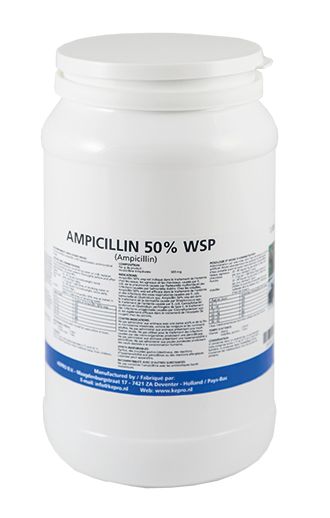 Ampicillin 50% wsp is indicated for the treatment of dermatitis, caused by Streptococcus spp. ; the treatment of enteritis, caused by E. coli, Campylobacter sputorum and Clostridium perfringens type C; the treatment of urogenital infections caused by Corynebacterium spp. and is effective in the treatment of erysipelas in pigs. Do not administer to animals with an active rumen and intestinal microbial flora, like rodents and adult ruminants. Do not administer to animals with an impaired renal function. Do not use for treatment of infections caused by penicillinase producing micro-organisms. Do not administer to animals hypersensitive to penicillins. Do not use in layers producing eggs for human consumption. Sometimes gastro-intestinal disturbances, hypersensitivity reactions to penicillins or allergic skin reactions may occur. Do not combine ampicillin with bacteriostatic antimicrobial drugs. For oral administration via drinking water or milk replacer. Rinse the drinking water systems thoroughly before and after administration of ampicillin. Calves, lambs, kids : 20 – 40 mg per kg bodyweight, twice daily, during 5 days. Pigs : 1 – 2 kg per 1,000 litres of drinking water or 20 – 40 mg per kg bodyweight, twice daily, during 5 days. Poultry : Use amount of Ampicillin 50% wsp as stated in table in 1,000 litres of drinking water. Medicated drinking water should be used within 4 hours. Store in closed packing. Keep medicine away from children. PE-Pharma jar of 500 g (12 jars per box). PE-Pharma jar of 1,000 g (6 jars per box).